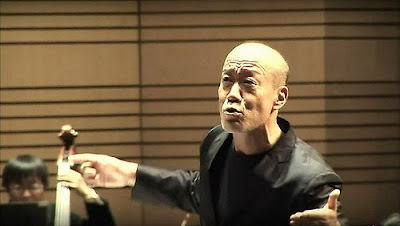 Joe Hisaishi (久石譲), also known as Mamoru Fujisawa (藤澤守) is a great composer and director known for over 100 popular film scores and solo albums. I'm sure many of the shows were so popular that you won't miss them out such as Studio Ghibli's Totoro, Spirited Away, Howl's Moving Castle, Princess Mononoke, Naustica of the Valley of the Wind, The Sky City and etc. So how do I come across Joe Hisaishi's songs? Well, I've always been watching Studio Ghibli's cartoons since very young but I didn't realize those wonderful songs were actually written and composed by Joe until I watch Howl's Moving Castle's trailer and the background music caught my attention. One of my favourite songs by Joe Hisaishi was 'Oriental Wind' introduced by Chris. This song started off gently where strings played along with Joe's soothing piano. It was then a drastic transition occurred at the middle of the song where the tempo became catchy enough to make my eyes widened for a while. From the video clip of the live concert, you can see various kind of instruments were used including ethnic percussions, er-hu, xylophone, saxophone and strings. 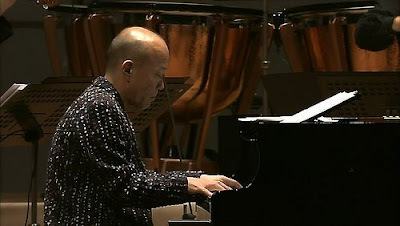 Joe Hisaishi is truly a great music composer. Whenever I listened to his songs, it always gave me the impression that he's so deeply in-loved with music and that is why all the songs he produced were so popular not only among the shows and cartoons, but also in many orchestras and concerts held in Japan. Keat®. Awesome Inc. theme. Powered by Blogger.